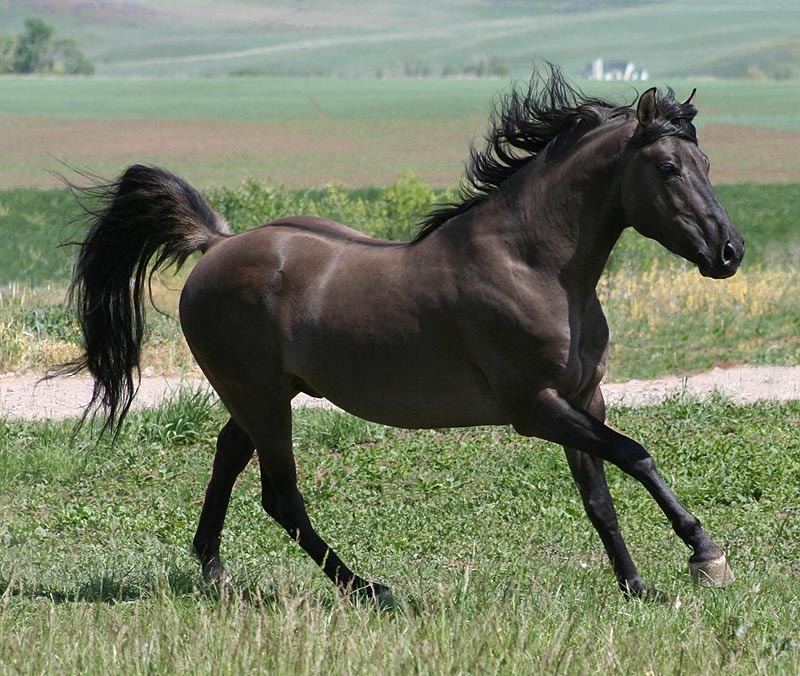 Dun is a dilution gene that lightens both red and black hair on the horse's body. It is also associated with primitive markings, which generally include a dorsal stripe and leg barring, and may also consist of dun colored frosting on the sides of the mane and at the tailhead, dorsal barbs, cobwebbing, white ear tips and barring on the ears, and a facial mask of darker hair. 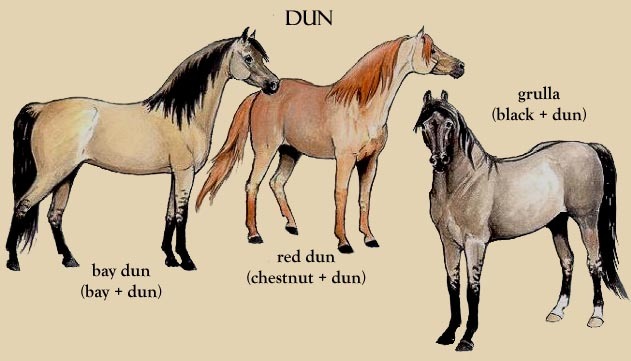 Because dun is a dominant gene, all dun horses have at least one dun parent. 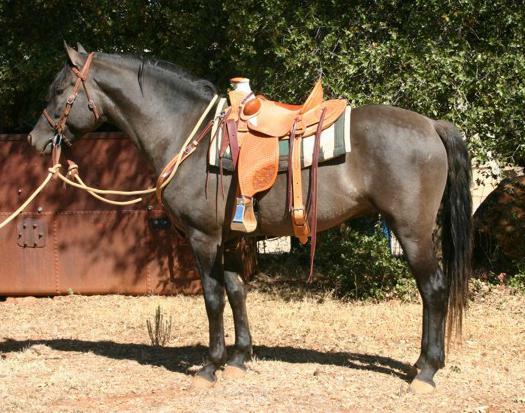 Dun on a black base is called grulla or black dun. Grulla horses are very striking with a silvery gray body color, black points, mane and tail frosting and primitive markings. When bays or browns are diluted by the dun gene, they become a bay or brown dun, sometimes called a zebra dun. 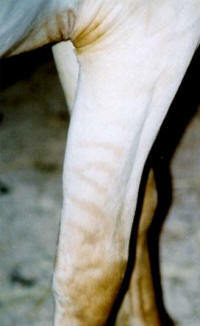 They are some shade of red-gold to cream on the body with black points and primitive markings. Chestnuts with the dun gene are called red duns. 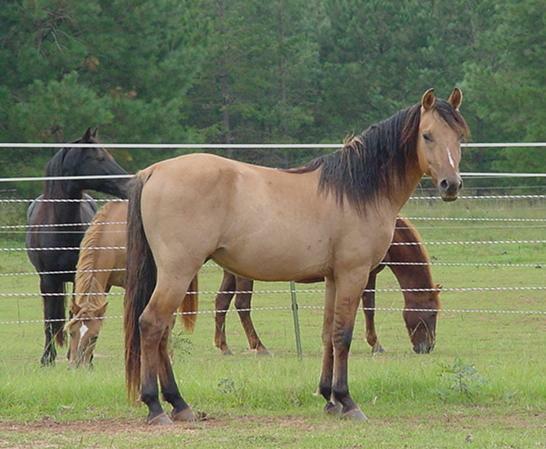 Dun in combination with one cream gene creates dunalino (dun + palomino), dunskin (dun + buckskin), and smoky grulla (dun + smoky black). Like all colors, there is a range of shade in the dun colors, from so dark as to look almost nondilute to very pale. D/D – horse has 2 copies of Dun dilution. All foals will be dun-diluted. 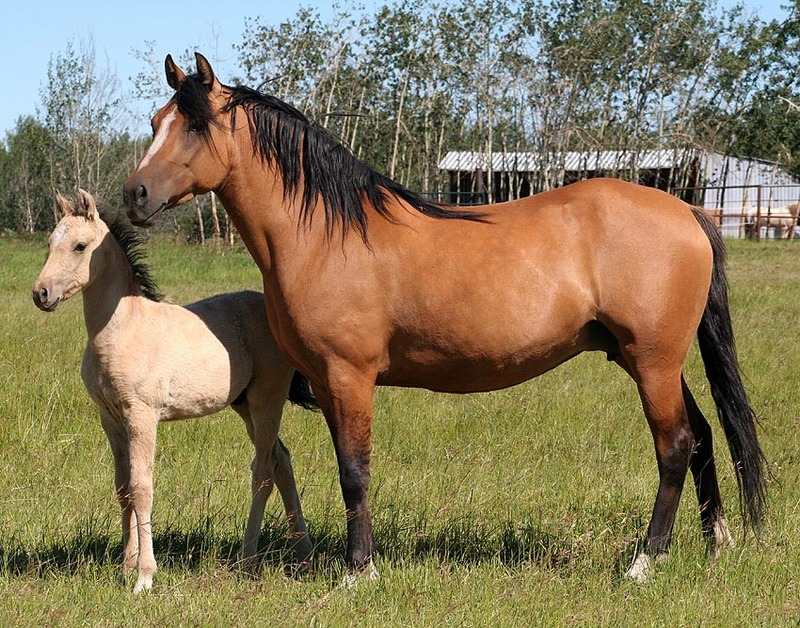 D/nd1 – horse has 1 copy of Dun dilution and 1 copy of nd1. D/nd2 – horse has 1 copy of Dun dilution and 1 copy of nd2. nd1/nd1 – horse is not Dun dilute and has 2 copies of nd1. Primitive markings may be present. 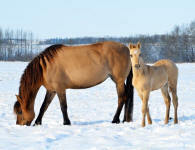 nd1/nd2 – horse is not Dun dilute and has 1 copy each of nd1 and nd2. Primitive markings may be present. nd2/nd2 – horse is not Dun dilute and has 2 copies of nd2. Primitive markings are absent. 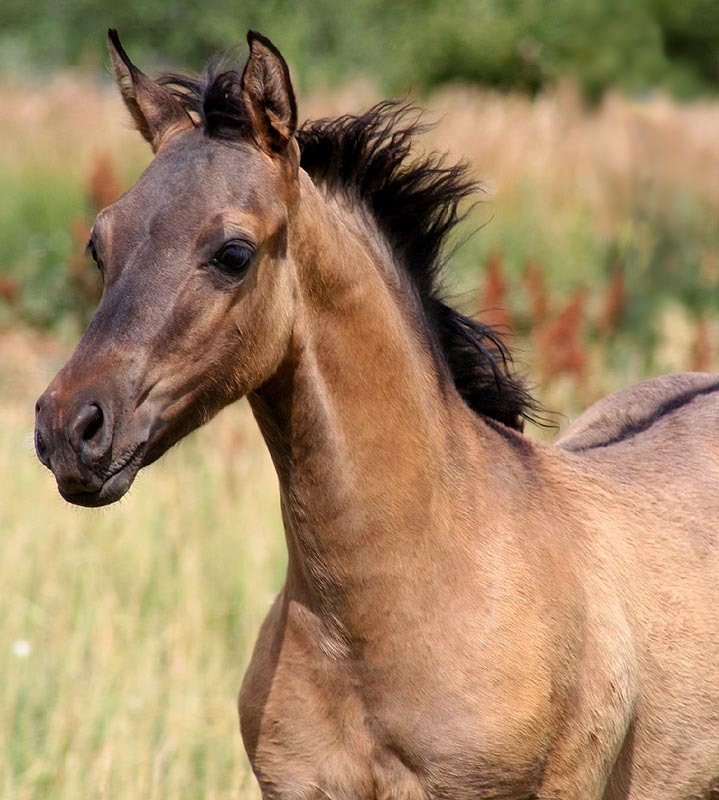 It is important to note that only horses with at least one "D" gene are actually dun. 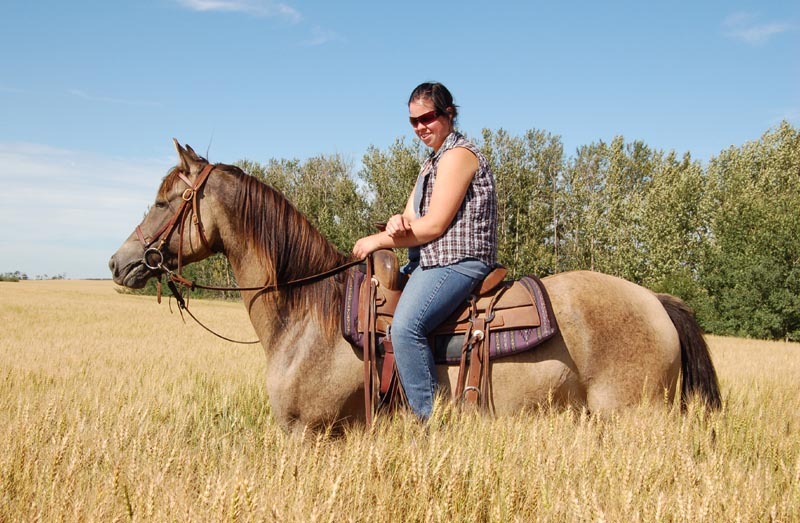 All dun Morgans come from one line, through the 1964 smoky grulla mare Pendleton Buck Missy. It is a bit of a mystery where Missy's dun gene, the only proven source of dun in the breed at this time, came from. 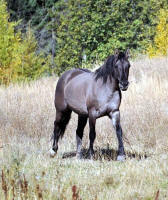 Her dam, Cute, appears to be a smoky black in pictures, and her breeding (by Ketchum, a smoky black who was also the sire of Chingadero, and out of Smokie Brown, who may also have been some sort of cream dilute, given her breeding) supports this. Missy's sire is given as the chestnut stallion King Richard. "The Cute Conundrum", which details the origins of the dun gene in Morgans. 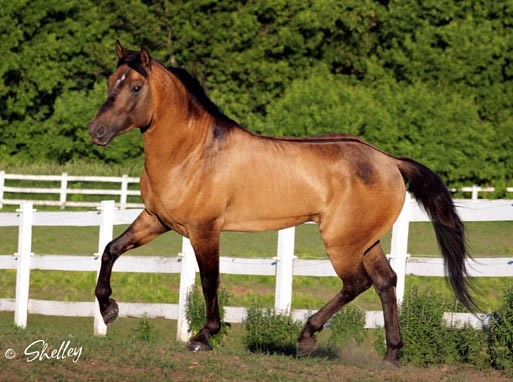 MARANA DUNKE SHAY (Mirabellas Mondo x DM Mercy Me) 2010 dunskin (buckskin + dun) stallion owned by RG Morgans. Photo courtesy of Anne Ward. ROYAL GOLD ARISTON (Finallys Mr Amos Frick x Par-Bets Fascination) 2007 dunalino (palomino + dun) stallion owned by Aesthetic Equine. 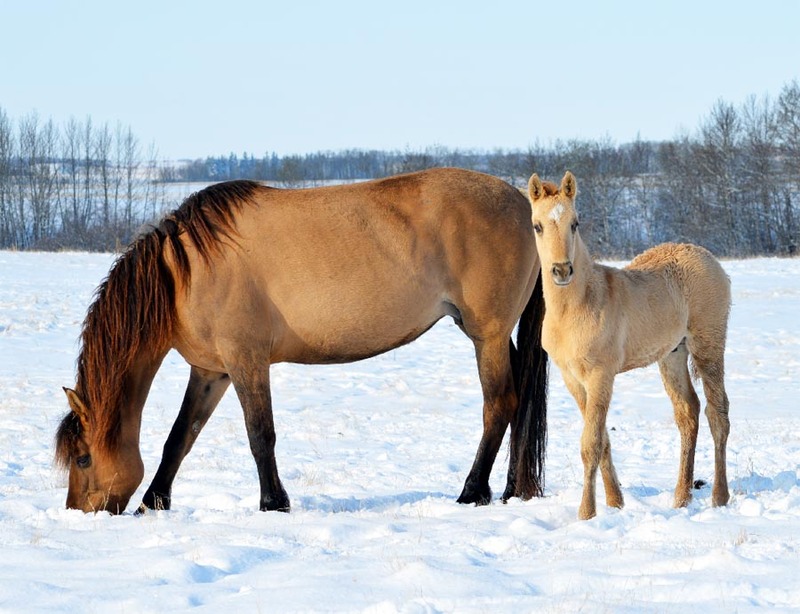 ALPINEMIST DESERT ROSE (Successful Sorcerer x Tindo Nice As Spice) 2008 red dun mare, with her 2015 dunalino (palomino + dun) colt, Coulee Bend Uniquely Dun (by Cassety Hollow Sundancer). Rose is at the extreme dark end of the red dun spectrum- she looks very much like a bay dun with her dark points. She tested ee Aa Dd and her base color must be a very dark shade of chestnut. Owned by Coulee Bend Morgans. 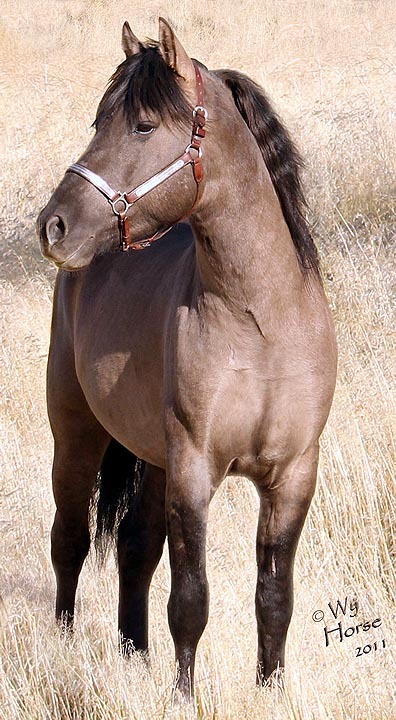 TRUWEST SILVER SUEDE (S Bar B Pierre Noire x Truwest Adobe Rose), 2008 smoky grulla stallion owned by Bar None Morgans, WY. Suede has a cream gene from his sire and a dun gene from his dam. 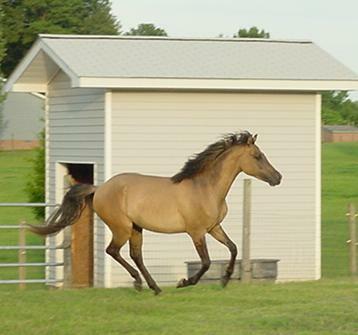 LADY DUN D DUCHESS (Ragtime Dun D x Liberty Bend Lady JL), 2007 grulla mare owned by Mountain Home Morgans. The darker face masking of a dun can be clearly seen here. 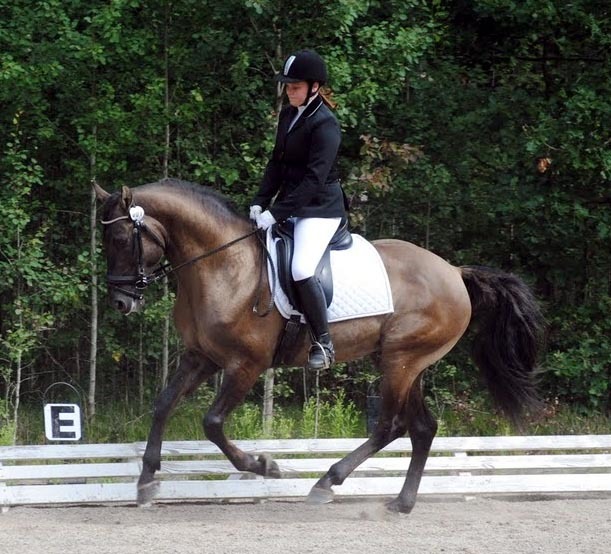 AMBERFIELDS DUN HEARTBREAKIN (FPS Success Made in Dun x Amberfields Lady Amythest), 2006 grulla stallion owned by Idets Morgans, Sweden. Pictured in dressage at the Swedish Morgan Nationals. Photo by Sara Alvrud. ALPINEMIST BLACK PEARL (Successful Sorcerer x Tiona's Glorious Love), 2007 grulla mare owned by Kathy and Mackie Hartwig. 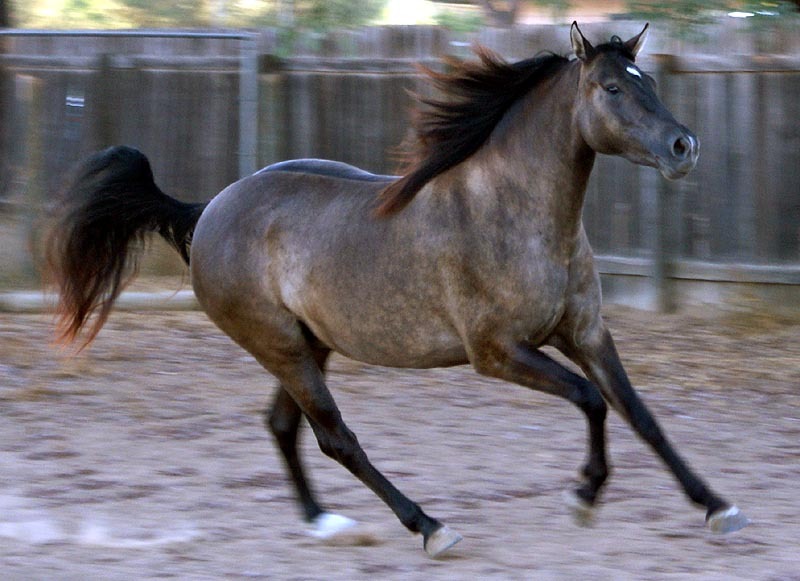 MIRABELLA'S MONDO (RCK Ragtime Tres Oros x Rustic V Sweet Dreams), 2007 bay dun stallion owned by Marilyn Vander Wekken, Marana Farms. Matt Rustermier, up. 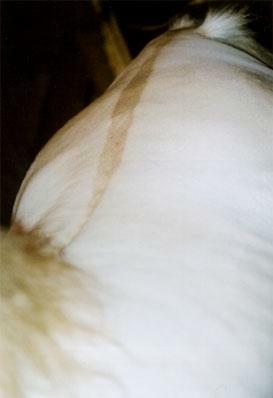 Some duns can be very close in shade to non duns, but on close inspection the dun factor markings are generally apparent. 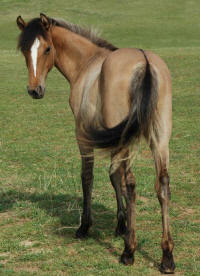 FOXTON GOLDUN CLOUD (Mocomo Gold N Diamond x Amberfield's Dun Lovin') 2006 dunskin stallion owned by Foxton Morgans (pictured as a two year old). 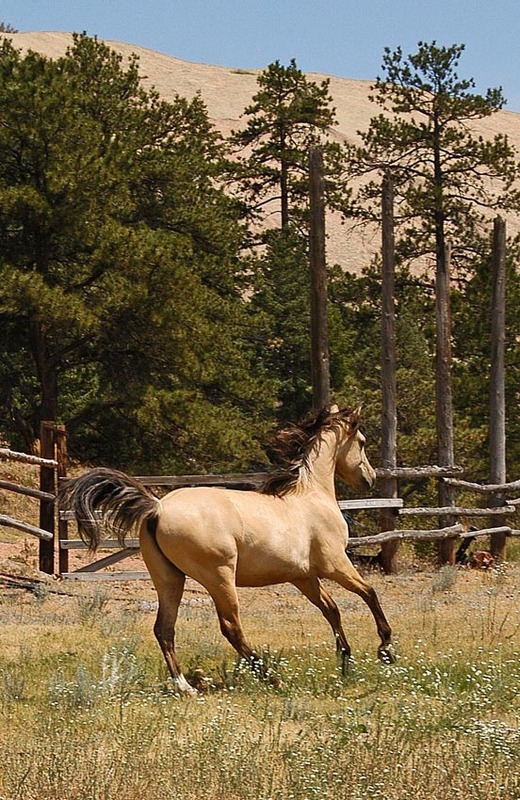 Goldun is carrying one cream gene and one dun gene, making him both dun AND buckskin. 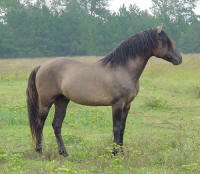 "Dunskin" is the general usage term for such horses. 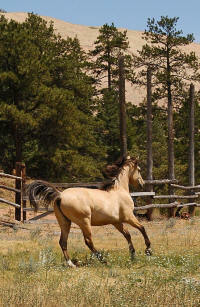 Red duns who are also palomino are called "dunalino" and grullas who are carrying cream are called "smoky grulla". Some of these combination dun-cream dilutes will have their dun markings lightened a few shades by the action of the two dilutions working together, as shown here. 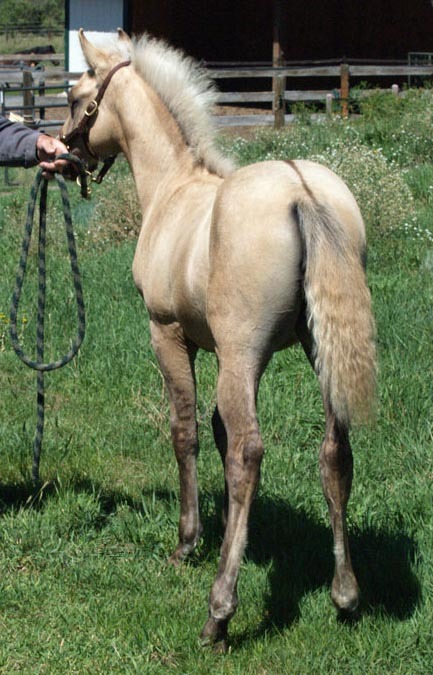 This is not generally true of brown-based dunskins or smoky grullas, since the cream gene does not have much lightening effect on black and brown base colors. 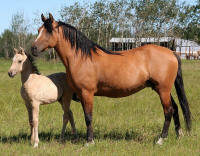 MIRABELLA'S MESMERIZED (RCK Ragtime Tres Oros x Whispering Fancy Flaire), 2008 dunskin mare (pictured as foal, and as a 3 year old) owned by Coulee Bend Morgans. First photo courtesy of Roger White, second by Cindy Dietz. LINEBACK HIJA DE SUE (Robbi Sue's Success Story x Cushman's Melanie Dun Sue), 2003 bay dun mare, owned and photographed by Janine Welsh of Homestead Morgans, with her 2008 dunskin colt HMSTD WELL DONE (by R Two Little Zipper), owned by Beverly Dunn. STONE PINE HANNAH (Finally’s Mr. Amos x Tara’s Indigo) 2006 dunalino filly (palomino plus dun). The crisp dorsal and leg barring of a dun can be clearly seen. Photo courtesy of Marilyn Esteb. 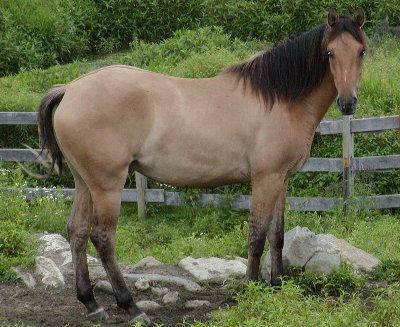 AMBERFIELDS INDIGO SKYE (FPS Success Made in Dun x Amberfields October Skye) 2006 grulla mare owned and photographed by Dana Flaherty. HANG N GIT R DUN (Ragtime Dun D x GVF Enchantress Command), 2008 brown dun stallion (pictured as a weanling) bred by Moonridge Morgans, Preston ID. Photo courtesy of Wendy Hanger. 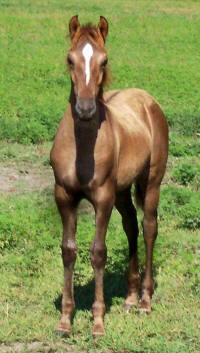 KING'S CRIMSON COMET (Smokestorm x Hilton Royal Charm), 2008 red dun gelding (pictured as a weanling). 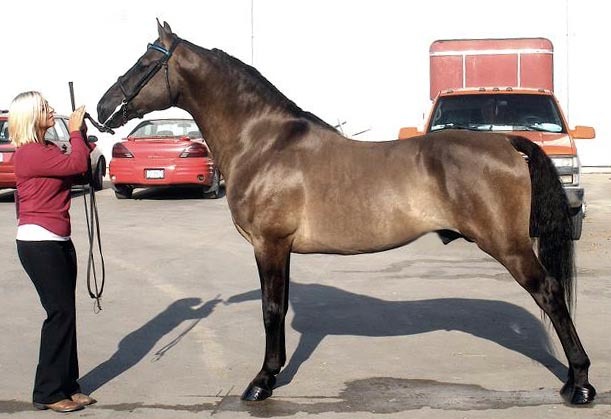 Photo courtesy of his breeder Shelia Lomax. RAGTIME DUN D (Ragtime Voodoo Magic x Successful Outta The Blue), 2003 grulla stallion owned by Mountain Home Morgans. You can see how his dorsal strip travels down into his tail, with "frosting" on either side of it at the tailhead. Photo by Jodi Thorpe. STORM QUEST (Stormwashed X Tigers Silent Saint), 2002 grulla gelding with Steve Wyandt up (left) and AMBERFIELD'S JAZZTIME MORO (Stormwashed X Tierra's Sonnet), 2000 bay dun mare ridden by Jackie Wyandt (right). Pictured at the May 2007 Mississippi Valley Morgan Horse Club breed demo at the Lewis and Clark Historic Center in Hartford, IL. 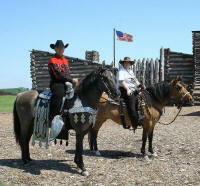 Both horses owned by Jackie Wyandt. Photo by Kathy Firch. RCK RAGTIME TRES OROS (Robbi Sue's Success Story X Robbi Sue's Mystique), 2000 dunskin stallion. Tres has very marked dorsal barbs along his dorsal stripe, as well as quite dark facial masking. He has both the dun AND the cream gene. His very dark shade in the presence of these two dilution genes means his base color is probably dark bay or brown, rather than a lighter bay. Photo by Shelley. RIVER JORDAN (Stormwashed X Light Up Atlanta), 2005 grulla stallion (pictured as a suckling). Photo by Laura Behning. LINEBACK MILADY IN RED (Robbi Sue's Success Story X Ben's Tekhanto Lady), 2003 red dun filly, pictured at age two. Owned by Rhonda Sewell. Photo by Laura Behning. 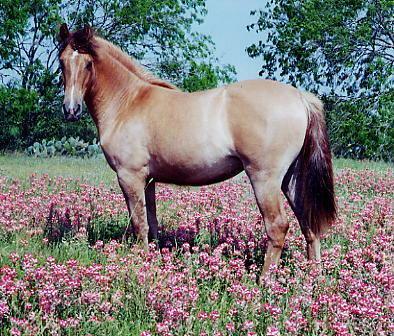 AMBERFIELDS STARS N STRIPES (Stormwashed X Amberfields Lady Amethyst), 2002 grulla gelding owned by Theresa Sheridan. 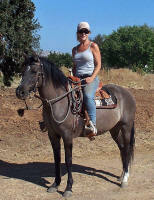 "Rocky" is shown here modeling Theresa's beautiful buckaroo style saddle. 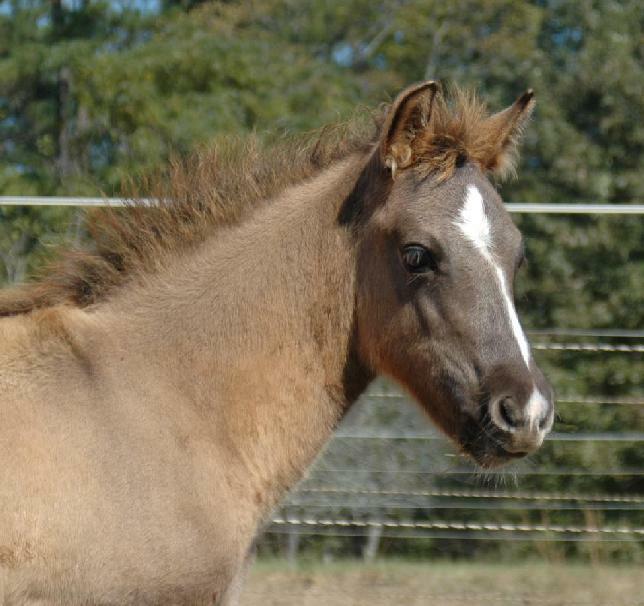 ALPINEMIST CARAMEL RIPPLE (Successful Sorcerer X Bar D Paloma), 2004 dark bay or brown dun mare (pictured as a yearling) owned by Theresa Sheridan. 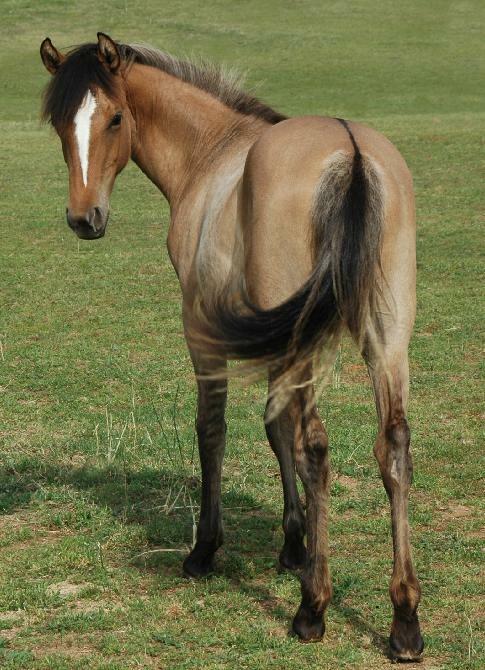 Notice her dorsal has a "painted on" look and how it carries on right down into her tail, with dun colored frosting on either side of her tailhead. Photo by Laura Behning. ROBBI SUE'S SWEET SUCCESS (Equinox Beaubrook X Robbi Sue's Misalert) 1993 bay dun stallion owned by Tami Kikta of NY. 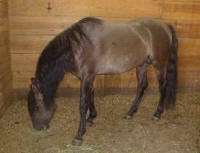 "Zeke" is a very dark shade of bay dun that might be mistaken for non-dun until the observer notes the dun markings on such horses. You can see the dun frosting on Zeke's tailhead in this picture. 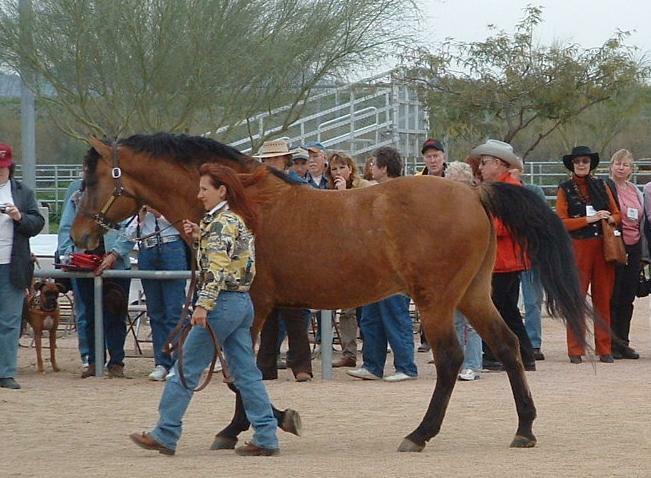 Photo by Beth Binion, taken at the "Parade of Color" at the 2005 AMHA Convention in Phoenix AZ. Theresa Sheridan is leading Zeke. LINEBACK DOUBLE TAKE (Robbi Sue's Success Story X Cushman's Melanie Dun Sue), 2002 bay dun stallion owned by Coachman's Rest Morgans. "Doub" is homozygous for dun. Pictured as a two year old. Photo by Laura Behning. Closeup pictures of the dun factor markings on FINALLY'S MR. AMOS (Robbi Sue's Mr. Alert X Finally Tuesday Morn), 1998 perlino dun stallion owned by Royal Gold Morgans, Caledonia IL. 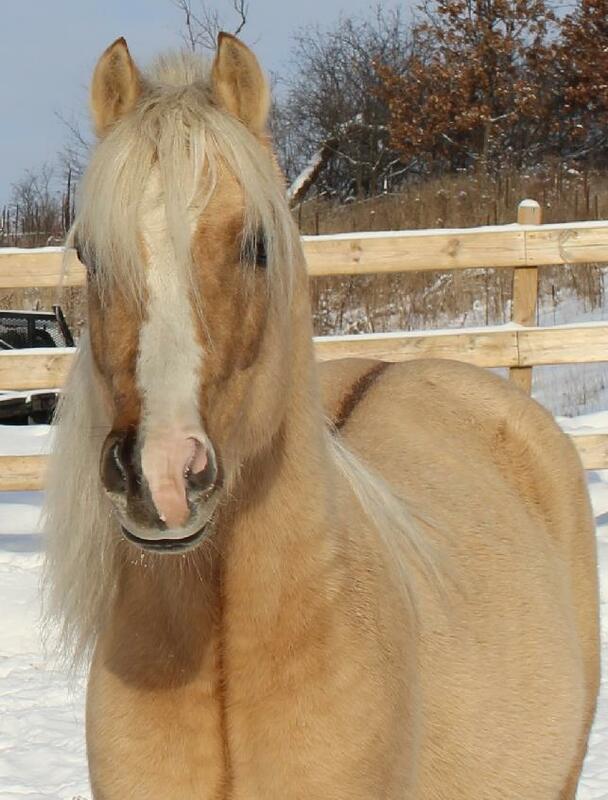 Amos is a combination dilute- he has two cream genes, one from his buckskin sire and one from his dunskin dam, who also passed on her dun gene to Amos. Another picture of Amos can be seen here. 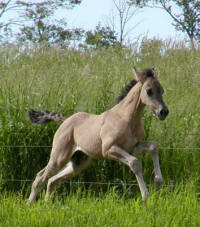 WMS LAUREL SILVER DUST (Delmaytion Top King X Successful Reflection), 2003 grulla stallion bred by WM-CAR-WMS Morgans. Now owned by Susan Graf in NE. STORMWASHED (Robbi-Sue's Sweet Success X DBF Black Nightcloud), 1996 grulla stallion owned by Bob and Kellie Sharpe. Photo by Laura Behning. 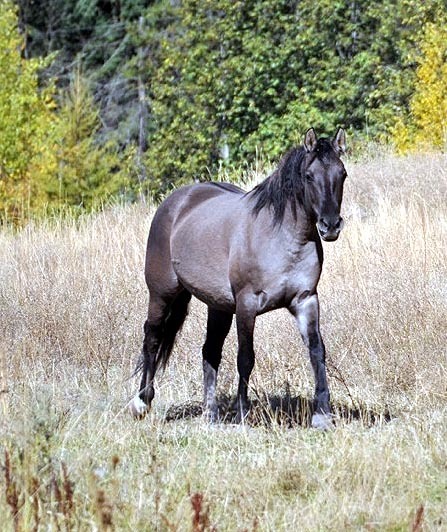 SUCCESSFUL SORCERER (Robbi-Sue's Sweet Success X Royal T Lady Kitrina) 1997 grulla stallion owned by Alpine Mist Morgans in ID. 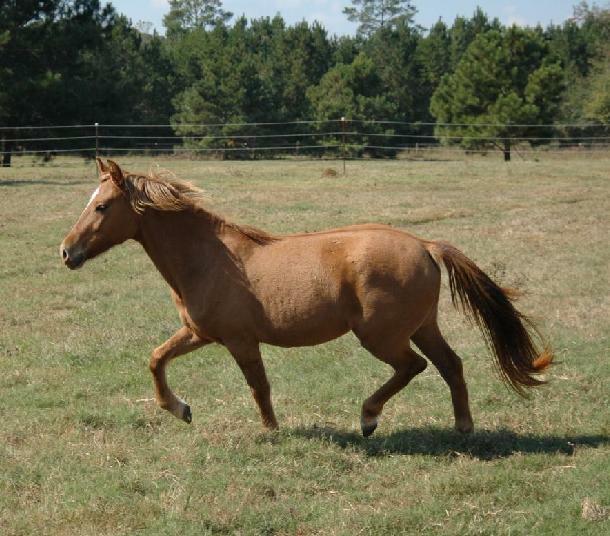 ELLY'S STORY (Robbi-Sue's Success Story X ML Meadowlark Elly Mae) 2000 red dun mare (pictured as a yearling) owned by Garnet Robinson, Floresville, TX. 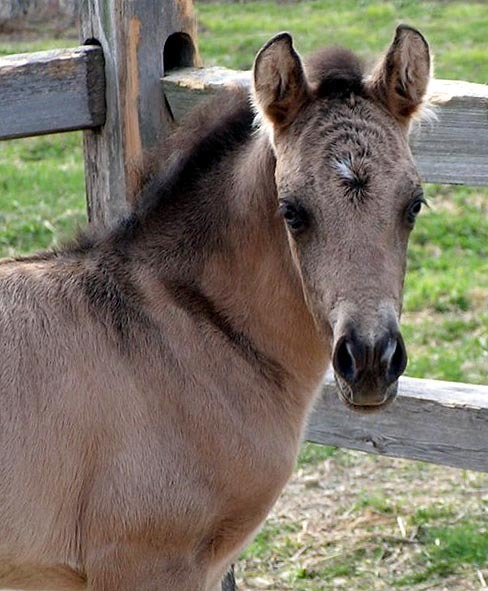 AMBERFIELD'S LONESOME DOVE (Stormwashed X Amberfield's Jellybean), 2000 grulla mare (pictured as a weanling) owned by Judy Hinman, Amberfields Morgans, West Edmeston NY. AMBERFIELD'S DUN LOVIN (Stormwashed X Finally's Just A Dandy), 2001 brown dun mare (pictured as a two year old). To see more pictures of Lovey, visit her web page of pictures taken by her former owner, Laura Behning. WMS LAUREL LADY BETTE (Delmaytion Top King X Successful Reflection), 2002 bay dun mare (pictured as a two year old) owned by Windfield Morgans, Lee Lyons, CT. Photo courtesy of Bette's breeder, Carol Williams.